So this year I thought I give him something new. How about some fungus?! (with a few dead leaves there at the bottom). Actually, I really like this stamp. Its part of a cling set called Toadstools from Serendipity Stamps. Its fun to color and with all the shading in the image its pretty easy. I colored this with my Copic markers and airbrushed the background. The cardstock is Prism. So - I've been thinking (dangerous I know) ever since my post on the color dusters, which are one of my favorite tools. I'd love to know what other people's favorite things are. What better way to find the "good stuff" than to talk to people who actually use it. So I'm going to test out a new feature called Friday Favorites. So lets start with the obvious - basic black ink pad. What is your favorite and why? I'd probably choose Versafine Onyx Black. I love it because its easy to ink with. You always get a even layer of ink. Its great for detailed stamps. The black is very opaque. It is waterproof and permanent. If I'm going to watercolor - its always my first choice. Its also the ink I always reach for to do sentiments - I love that I can stamp on colored cardstock it shows up so well. Its great with clear stamps and never beads up. They do not sell re-inkers for this pad, but I am astonished at how long mine has lasted. For me - the downside is that you can't use it with Copic Markers, the markers dissolve it and it smears. I have also found that I need to make sure the ink is very dry before using odorless mineral spirits (with Prismacolor Pencils). For Copic Markers I have been using Brilliance Graphite Black (heat set). I recently started playing with the new Mementos and they show some promise. So what is your favorite basic black ink? I also use the versafine onyx black and love it. What a wonderful idea for Friday's and what a great card, at least you are moving into the "food" groups for your husband's cards. thanks for sharing. I haven't played with that many different kinds. Right now I am using the Palette Noir and I really like it. I keep hearing great things about the Versafine though and might try that. Love the idea of sharing favorite products! Wow. Amazing card, beautiful coloring. Fungus. . .wow, that's different but I like it. It's a pretty fungus! LOL! 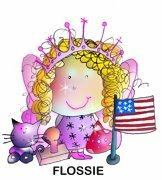 Your card looks fabulous! Love your coloring! My favorite tool is my "swivel sweeper". Gosh, that sweeper is fabulous! It's great on wood floors, tile, and carpet and it can sweep under tables, chairs, everywhere! I love Versafine . . .but sometimes, it can take time to dry even if it's suppose to be fast drying pigment ink. I love Stazon too! It dries quickly and it doesn't smear or mix with my Copics, Prismacolor pencils, or watercoloring. I thought your comment about giving him fungus this year was funny. I agree--masculine cards are difficult. 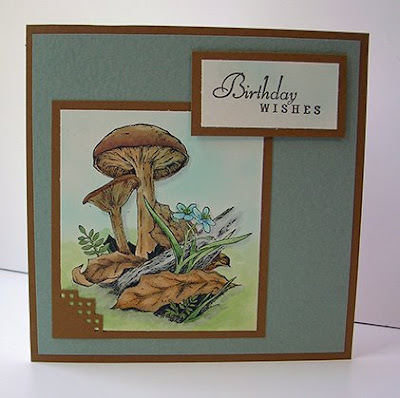 I'm sure he'll love this mushroom card--it's gorgeous. Cute card!! I just use regular black from su and the stazon. I'll to look at that other one. Seems to be a fave for many. This card is GORGEOUS! My favorite black ink is also Versafine. It is the best I've found for word stamps & always gives a crisp image. I also love it on w/c paper. It will not smear. VersaFine Onyx for me too. It seriously changed my stamping life! I do love loads of other black inks though like Brilliance, StazOn, and Black Soot Distress ink.